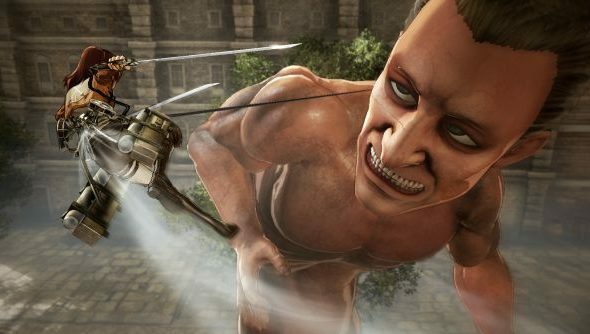 If you’re unfamiliar, Attack on Titan is a ludicrously popular anime/manga series, to the point where you’ve probably heard of it even if Japanese nerdery isn’t your bag. Even I’ve watched the first season plus read half the manga, and I’m barely out of the phase of calling them ‘cartoons’. It’s pretty great, an unbelievably depressing and quite violent tale of mostly-teenage kids fighting giant monsters that are coming to eat their families in a post-apocalyptic pseudo-fantasy world. It’s had a number of games, but this is the first that will be coming to PC, a third-person action title of waist-mounted grappling hooks and really very sharp swords. Yet another addition to the most exciting upcoming PC games list in years. See, it’s hooks that latch into surfaces that allow the scouts to effectively fly around in any area that isn’t massively open using compressed air and the power of physics. This lets them get to the Titan weakspot in the nape of their neck, the only way they can be killed. I knew this would be knowledge I’d need for work eventually, well done me-from-two-years-ago, you spent your time well. Battles will take place both in the large, single city that is humanity’s last bastion and outside it in the forests where the scouts venture for supplies. The story will follow that of the anime quite closely, meaning it skips most of the incredibly dull training segment from the manga and starts right in the thick of the action. Without spoiling anything, it probably won’t all be flying around slashing at things with swords, as a rather significant plot development will, presumably, be echoed with an equally large change in gameplay style. It’s hitting on August 30th, distributed via Steam, though it’s yet to have an official store page put up. Given the number of platforms it’s releasing on – PS3 and Vita are coming along with PS4 and Xbox One – it’s very possible it’ll be an incredibly poor port. Based on this trailer it’s not the prettiest game either, but so long as it runs as a solid framerate, no complaints from me. Hopefully we find out soon.